Portuguese Oregano - More often grown as an ornamental rather than a culinary herb, Portuguese oregano is widely used in island cuisine similar to Cuban oregano. 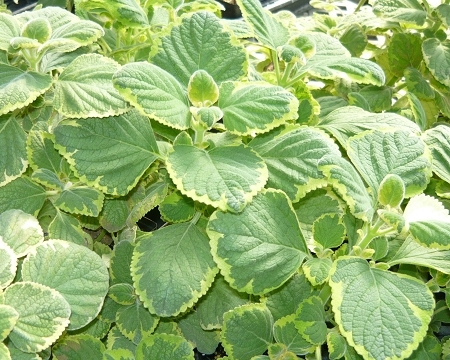 Large fleshy leaves are variegated white and green (or yellow and green depending upon growth conditions), leaves are thinner than regular Cuban oregano. Quickly grows into a large sprawling plant in tropical climates, can be container grown indoors with adequate light. Purple flowers when in bloom. Tender perennial zones 11+ Live starter plant in 3 inch container.